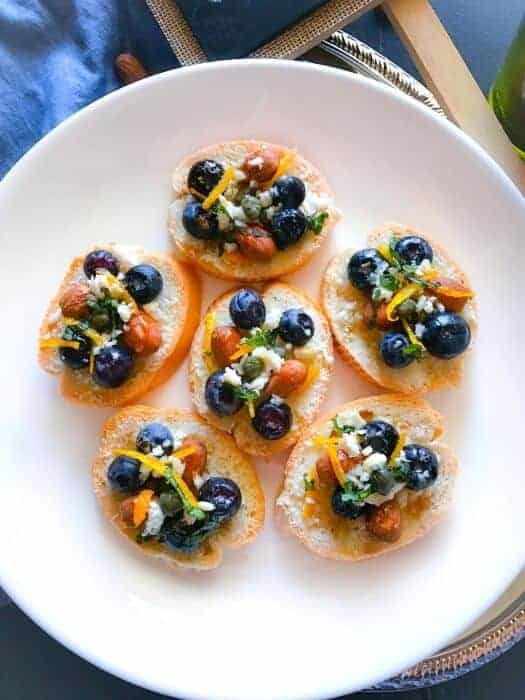 Quick and Hearty Almond – Ricotta Snack Bites are your perfect little sweet-salty bites made using roasted almonds, ricotta, blueberry, capers and orange rind and drizzled with honey. They are delicious, packed with heart-healthy ingredients and absolutely addicting. Okay, who’s ready for a 5 Minutes Snack? 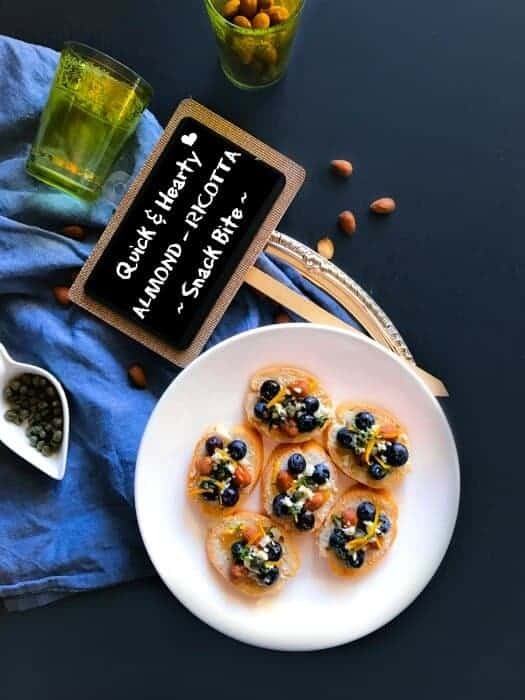 Something that’s easy to make healthy and super yum…presenting Quick and Hearty Almond – Ricotta Snack Bites which is all these things and much more. They are so easy to make that you’d think WHY didn’t you try them before and they are definitely the answer to those in-between meal cravings …think about that 3-4pm hunger pangs. Welcome to my everyday life snack situation. I’m a big-time snacker to such an extent that when I’m not working or when I’m stressed or overloaded with work, watching TV or just about any random time. I’m thinking about that ‘next snack’. Although I love snacking, I’m always striving to eat healthily and my all favorite snacks are ‘Roasted Almonds’. I usually have a small jar filled with roasted almonds + fresh fruits near my desk and keep munching in between. Also, as per new research, a healthy handful of whole or chopped almonds provides up to 25% fewer calories than previously thought, compared to the number of calories listed on nutrition labels. Also crunching on 1.5 ounces of whole or chopped almonds daily curbs appetite without increasing calorie intake or body weight. Hence they make an excellent choice for a heart-healthy snack. 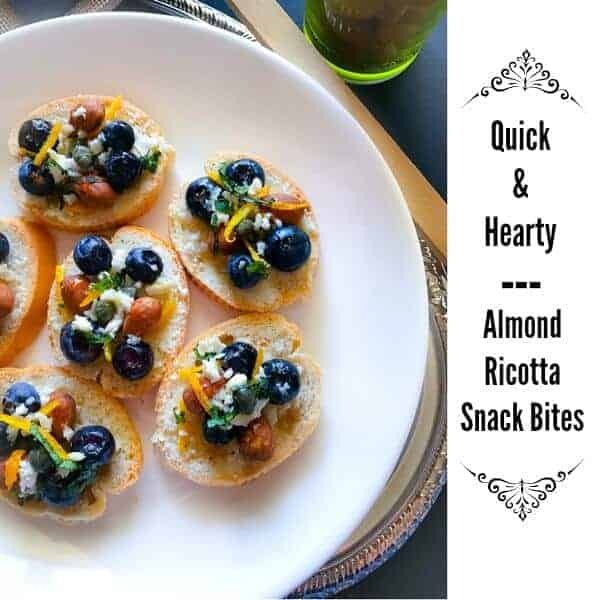 So, here I’m with my Quick and Hearty Almond – Ricotta Snack Bites which are made using your everyday pantry ingredients and takes 5 minutes. Also, since there’s no cooking involved (except for the toasted bread), these would be perfect for even any of your parties or picnic or snack at a go. 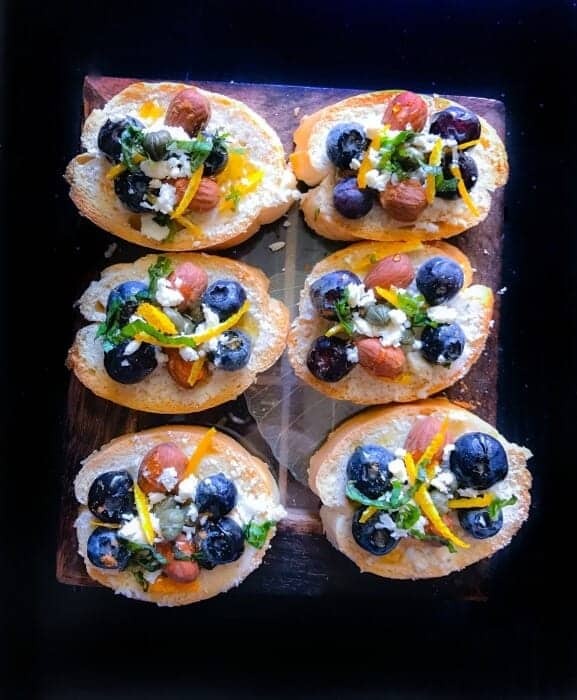 I used a baguette and sliced it into these tiny pieces but you can use just about anything as a base…you can even use a cracker. And trust me this combination of sweet + salty is just about everything you need to satisfy your cravings. To enhance the flavors even further, we are sprinkling some cinnamon and honey over it. Is an excellent source of antioxidants, vitamin E and magnesium. Provides 6 grams of protein and 4 grams of fiber. Is a source of calcium (8% DV), potassium (6% DV), phosphorus (15% DV), and iron (6% DV). Has 13 grams of “good” unsaturated fat. Has only 1 gram of saturated fat. Is naturally gluten-free and cholesterol-free. So I hope you try this recipe soon and satisfy the hunger pangs with this hearty and healthy snack. Add them to your meals throughout the day to add hearty crunch and unique flavor. You can learn more about Almond Month, get recipes and nutrition tips at Almonds. 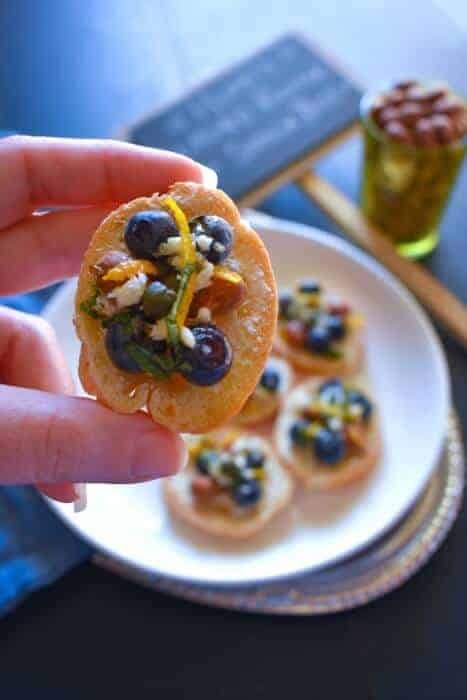 Quick and Hearty Almond – Ricotta Snack Bites are perfect little sweet-salty bites made using roasted almonds, ricotta, blueberry & drizzled with honey. Arrange the baguette slices in a plate. Smear ricotta on each toast (you can go light or heavy with ricotta). Add 3-4 roasted almonds on each slice. 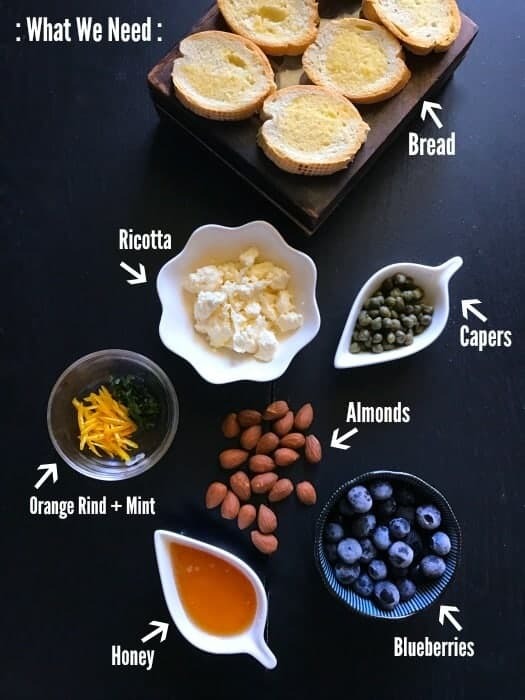 Add blueberries and capers on each slices. Sprinkle orange zest and sliced mint leaves. Drizzle honey and cinnamon on each slice. Finally, sprinkle some feta cheese on each slice. 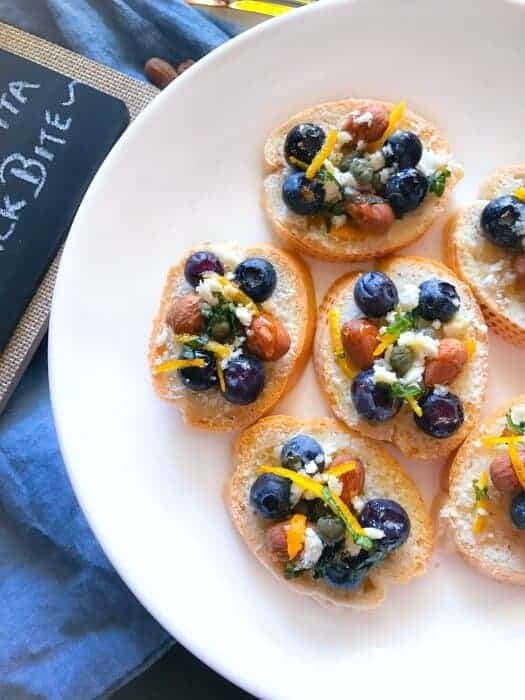 2 Replies to "Quick and Hearty Almond – Ricotta Snack Bites"
I love the savory/sweet combination of this snack.